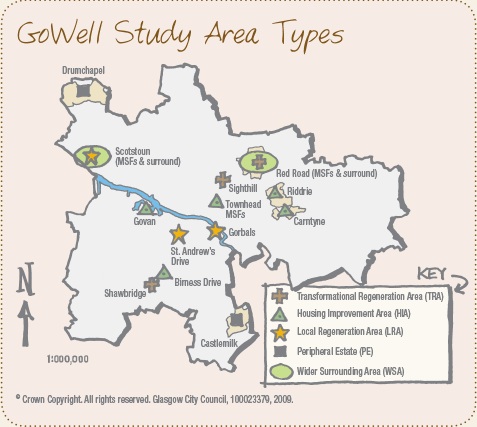 There are 15 communities involved in GoWell, chosen initially because of the type and timing of the investment and regeneration they would receive, and on the mix of housing types and tenures. These are categorised into five types of area - more information here. In addition to these 15 communities in the main study, there are six neighbourhoods in our East End study. Click on the map or on the list below to access information on each of the areas, including survey results, newsletters and information for participants. GoWell’s community engagement aims to facilitate capacity-building and empowered learning. It does this through a Panel of residents, newsletters and an online network.